Treatment of latent TB has always posed challenges. Today, we have effective therapies that are shorter and safer. The challenge now is to achieve wider coverage and scale. Approximately 1.7 billion individuals are estimated to be latently infected with Mycobacterium tuberculosis globally. We cannot end the TB epidemic without addressing this large pool of infected individuals. 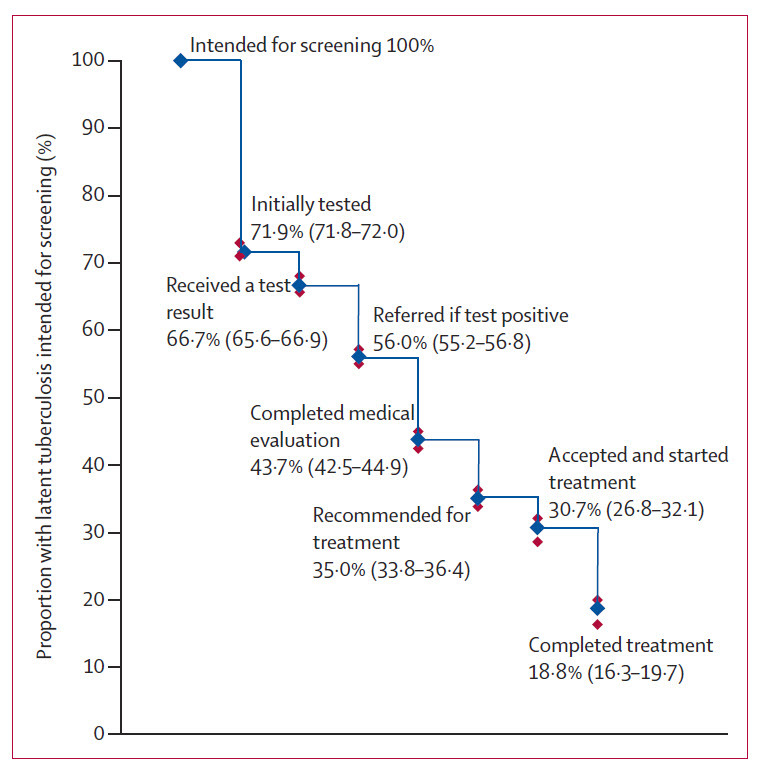 Although latent TB can be treated to prevent progression to active TB, latent TB treatment programs have always struggled to ensure adequate treatment completion. The cascade of latent TB care (shown below) is far from optimal and a large proportion of individuals do not complete the therapy. For decades, 9 months of isoniazid has been the conventional drug regimen for latent TB, and treatment completion rates have been suboptimal, even in developed countries with adequate resources. The search for shorter and safer drug regimens is finally starting to produce results. Today, the New England Journal of Medicine published two landmark randomized controlled trials, led by researchers from the McGill International TB Centre. The first paper presents the results of a large, multicountry trial which compared 4 months of rifampicin with the conventional regimen of 9 months of isoniazid. In this trial involving more than 6800 adults in 9 countries, the 4-month regimen of rifampin was not inferior to a 9-month regimen of isoniazid in preventing active TB. However, the 4RIF regimen was also not superior to the 9INH regimen. The rate of treatment completion was higher in the rifampin group than in the INH group. In the rifampin group, there was a significantly lower incidence of adverse events, especially liver toxicity. The second paper presented the results of a trial where 829 children were randomly assigned to receive isoniazid for 9 months or rifampin for 4 months. The results showed that among children under the age of 18 years, treatment with 4 months of rifampin had similar rates of safety and efficacy but a better rate of adherence than 9 months of treatment with isoniazid. 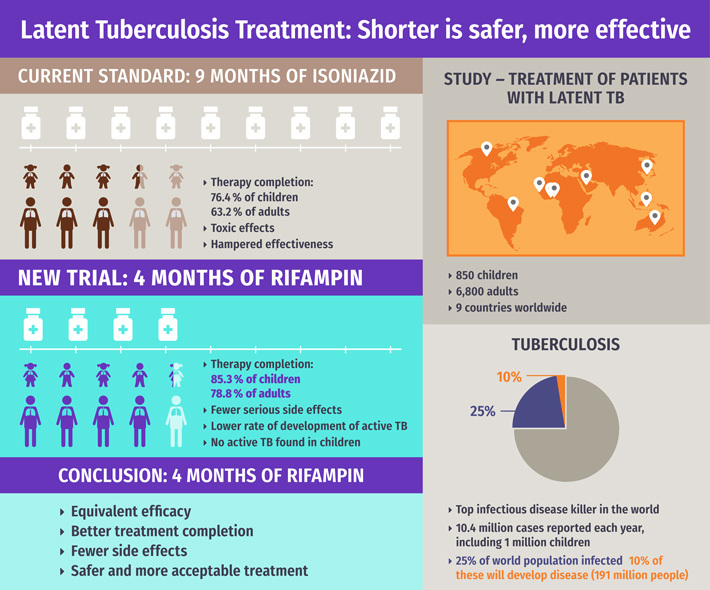 Taken together (infographic below), these trials provide compelling evidence that 4 months of rifampicin can become the new standard of care for latent TB therapy in both adults and children. In parallel, efforts have been made to further shorten the duration of latent TB therapy. Randomized controlled trials in adults and kids have shown that 12 once-weekly doses of INH and rifapentine administered by directly observed therapy (DOT) is as effective as 9 months of daily INH self-administered therapy. The 12-dose regimen was more likely to be completed when compared to 9 months of daily INH. Recently, investigators from the Johns Hopkins University presented the results of the ACTG 5279 trial at the 2018 Conference on Retroviruses and Opportunistic Infections (CROI) in Boston. In this Phase 3 trial, study participants were randomly assigned to a one-month course of rifapentine and isoniazid or a nine-month course of isoniazid. Overall, TB incidence was lower than expected and was similar in both treatment arms. Regardless of treatment type, TB rates were higher among participants who were not on antiretroviral therapy at the start of the study and among those who had had a positive TB skin or blood test. It is exciting that we now have rifampicin-based drug regimens that have effectively shortened latent TB therapy from 9 months to 1-4 months. 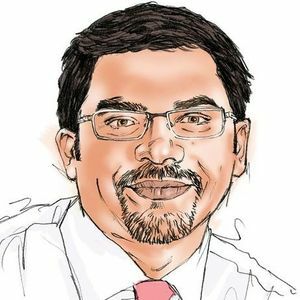 The challenge now is to ensure that these regimens are scaled-up in high burden countries, with serious investments to plug the gaps identified in the cascade of care. With shorter, safer drug regimens, there is no excuse for neglecting the problem of latent TB infection.